The article from Huffington Post Korea is in Korean ~ of course ~ but we already know the story of that little boy. 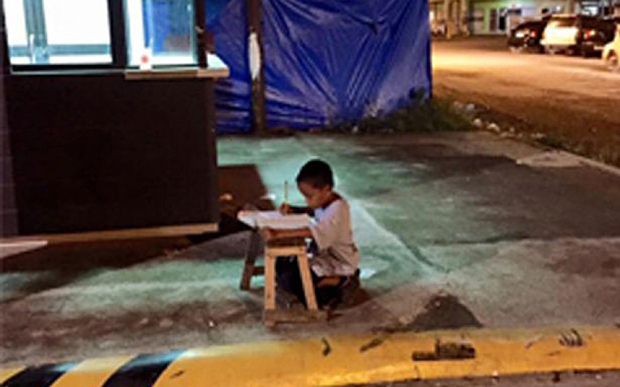 Joyce Torrefranca of Cebu saw the boy studying on the street at night. The boy and his family lost their home to a fire. He was finishing his English homework. Joyce was impressed, took the photo and posted on her Facebook account. The post has gone viral ~ the boy named Daniel Cabrera has been interviewed on TV. He said he wants to be a policeman someday. He is also getting a lot of help ~ including the pledge by Cebu police force to give him school allowance. The Huffington Post Korea posting has more than 20,000 likes and 600+ comments. ì•¼ ìš°ë¦¬ ë°˜ì„±í•˜ìž ~ Let’s reflect on this. ë‚´ ìžì‹ ì´ ë¶€ë„ëŸ½ë‹¤ ~ I am ashamed of myself. ì´ì•„ì´ë¥¼ ë„ì™€ì¤„ìˆ˜ìžˆëŠ”ê¸¸ ìžˆë‚˜ìš”? ~ Is there a way you can help this child? The photo of Daniel Cabrera not only impressed a lot of people on his determination to study. It is also inspiring other students to study harder. Hopefully, young ones living in developed countries would realize how lucky they are compared to the kids in developing countries like the Philippines. One Korean netizen who commented on the post said that “if you were born in our country, you would go to Seoul National University”. Experience tells us that success also depends on our attitude and Daniel Cabrera is showing that he’s got the attitude to make it in life. "공부를 하려고 가끔 카페에 가는 내게 이 아이는 큰 충격을 주었어요." Hats off to you Daniel!